A pair of no nonsense heatproof gloves. 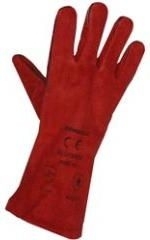 These gloves are ideal for operating hot stoves, using hot fire tools around the fireplace. They are a gauntlet style heatproof glove so they also afford some protection to your wrists and ends of your arms. They are made of suede, red in colour and are lined.